The SNP has replaced Labour as the largest party in Glasgow. However, with 39 out of 85 seats it was four short of a majority, meaning the party will now attempt to form either a coalition or minority administration in the city for the first time. Glasgow had been under Labour control for almost 40 years. 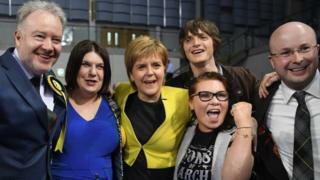 First Minister Nicola Sturgeon hailed it as a "fantastic, historic result" and the "end of an era for Glasgow but the start of an exciting new era". Labour, which had been in power in the city since 1980, dropped to 31 seats, while the Tories increased their number of councillors to eight and the Scottish Greens took seven seats. The Liberal Democrats lost their only councillor. Ms Sturgeon played down suggestions her party had not done as well as expected. "We've won this election today, or certainly we look as if we're on course to winning the election," she said. "I can't but feel proud of the SNP today. "More seats, more votes, more councils won, bringing nearly 40 years of Labour administration to an end and becoming the largest party in all of our major cities. "The SNP hasn't lost ground across Scotland today, what we've seen is the collapse of Labour and that's the reason for the increase in the Conservative vote." Labour's former council leader Frank McAveety, who retained his seat in Shettleston, said: "The SNP predicted they could return 56 councillors, they've only returned 39 councillors. "The people of Glasgow have made a quite clear signal to the SNP to stop dividing the country and stop dividing Glasgow. They claim that Glasgow was a 'Yes' city, today they have said 'no thanks' to the SNP." Thomas Kerr, 20, was one of the Conservative councillors elected as the party's fortunes rose, taking a seat in Shettleston. He said: "I'm shocked... when you stand as a candidate for the Conservatives in the east end of Glasgow you don't expect something like this to happen, but I think people recognised I'm a local voice and will stand up for local issues." SNP group leader Susan Aitken retained her seat in Langside and hinted at forming a coalition to run the council, rather than running as a minority administration. Green co-convener Patrick Harvie, whose party is seen as a front-runner for a coalition pairing, praised the surge in the Green vote and said a more "balanced" council would give the elected Greens the chance to push for a more radical agenda.